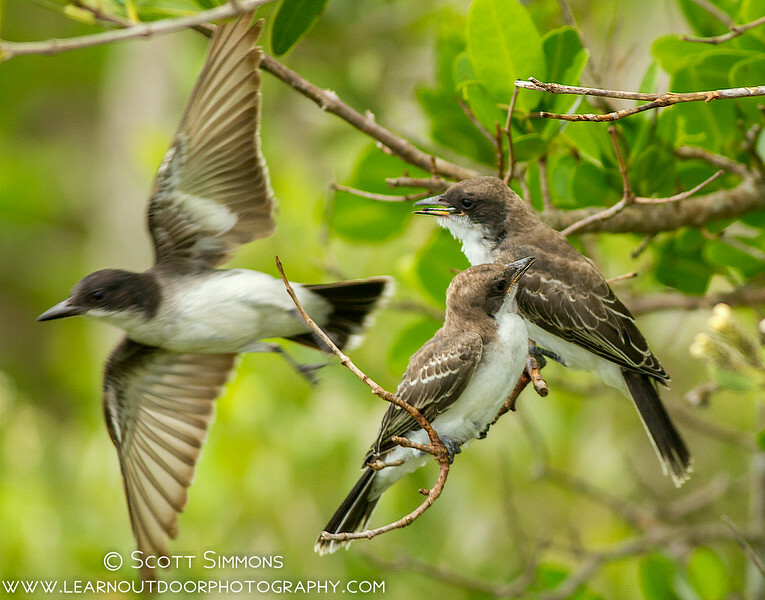 Earlier this month I visited Merritt Island National Wildlife Refuge (near Titusville, FL), and I happened across a family of Eastern Kingbirds. Several of them breed on the island, and there's one particular location where I often see them during the summer months. In fact, I believe I've seen them here every year since I moved to Florida in 2010. This year was the first year I've seen actual fledglings here. 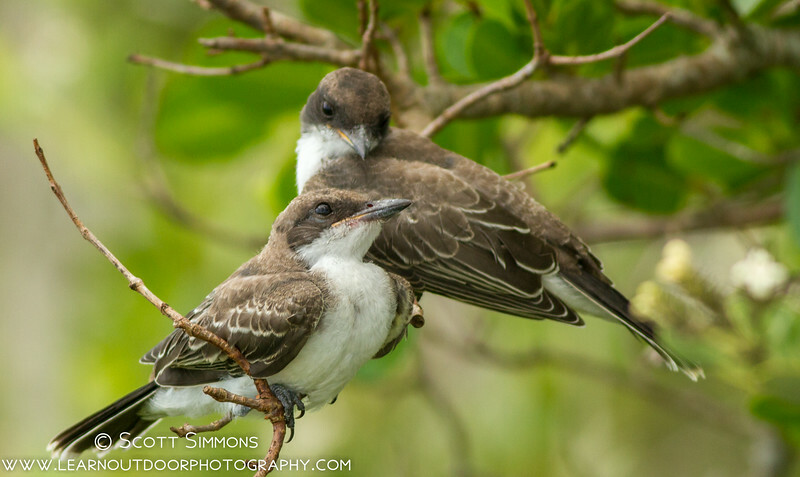 Two fledglings were perched on the same branch, anxiously awaiting being fed by their parents. We watched this family from a safe distance for several minutes; I'm always touched by the tenderness that the parents exhibit toward their young--at least that's the way their behavior appears to me as a human. 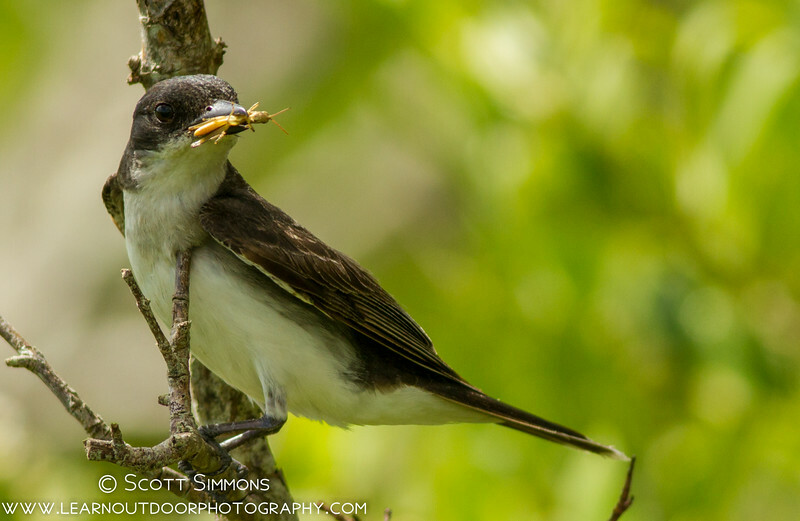 I saw the kingbirds come to the fledglings twice with food and feed each of the two fledglings. The young ones were all too eager to receive their meals! As you can see, the fledglings look a bit different from their parents. They are a little grayer with a darker mask around the eye, and the white-terminal band at the end of the tail has not yet fully formed. 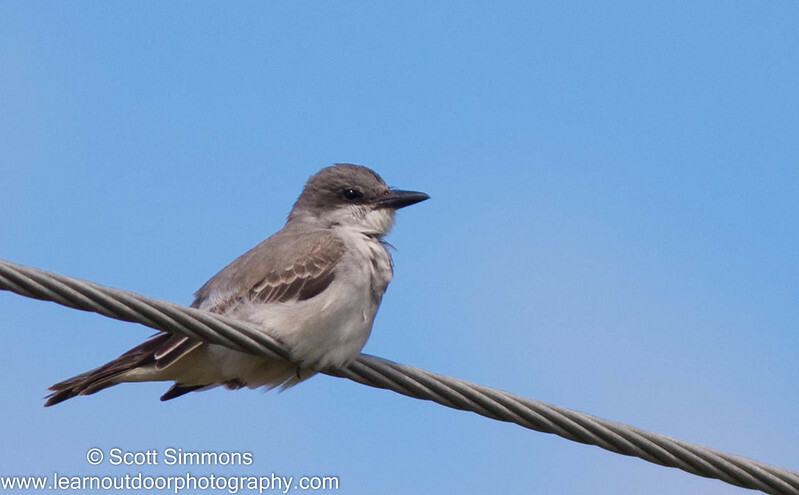 This can cause some confusion for people visiting the coastal areas of Central Florida in search of Gray Kingbirds, since they are superficially similar. But Gray Kingbirds are a bit lighter-colored, lack a white-terminal band, and their dark eye-mask has a different shape than juvenile Eastern Kingbirds, so they aren't too hard to tell apart for observant birders. 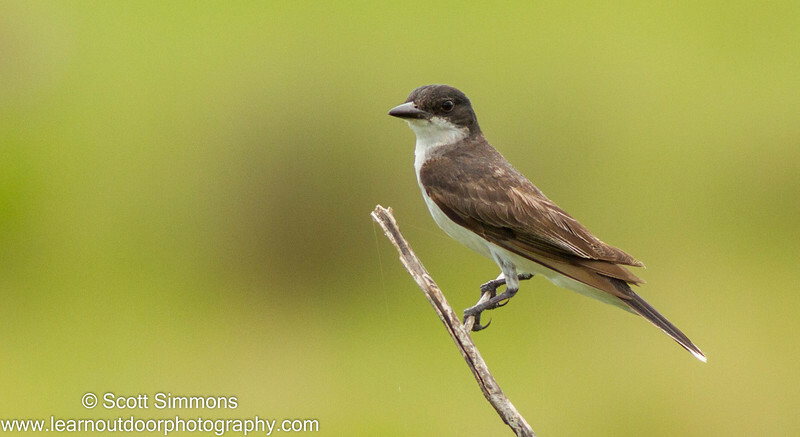 Eastern kingbirds may lack color--a study in black and white--but I find them strikingly beautiful birds. And I marvel at their abilities--it really is amazing how flycatchers are able to capture fast-flying insects like dragonflies in flight. And I especially enjoy the aggressive way they defend their nests and young. They will harass birds many times their size in defense of their territory. After all, they aren't called "tyrant" flycatchers for nothing. 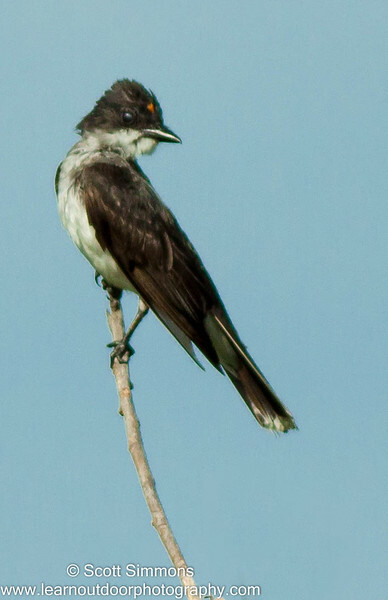 And if you're lucky, you may be able to see the color they do have--the "crowns" that earn them the name "kingbird." Marvelous post! 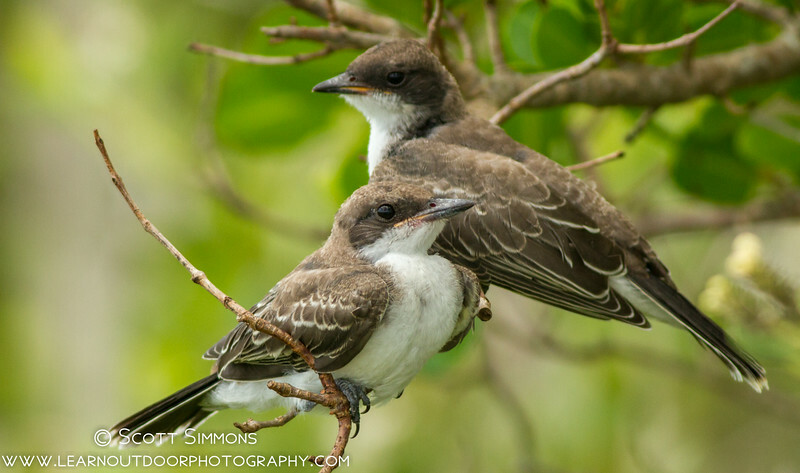 What a joy it must have been for you to observe these kingbird parents tend to their young. Excellent photographs, Scott!